In the summertime… do you drive with your shoes on, or your shoes off? 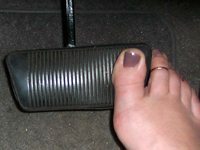 In the summer months, when I’m tyipcally sockless and/or wearing sandals, I always drive barefoot! In the winter months… unless I’m wearing lace-up hiking boots or something, I usually kick off my shoes whenever I’m driving. 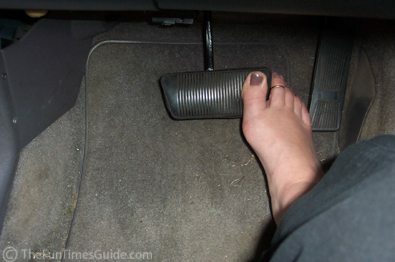 I think this silly ritual started years ago when someone convinced me that the right heels of your shoes wear out faster than the heels on your left shoes — from driving! For the most part, this is true. Especially if you buy cheap shoes like me, you can unevenly wear out the corner soles of a pair of shoes in no time. My barefoot driving habit has saved me a fortune on new shoes!